This project addresses the dire need for updated and enhanced technology in the Curriculum Materials Center (CMC), which is the education library and a branch of the University of Central Florida Libraries. The Curriculum Materials Center, located in the Education Building, serves a population of 6,000 students who are education majors (undergraduate and graduate). However, any student on campus may check out resources from the CMC or use its facilities. The CMC not only serves as a library and learning lab but also as the only computer lab between the three education buildings—Education Complex, Teaching Academy, and the Morgridge International Reading Center—which makes us, according to non-education majors, the best kept secret at UCF. Many UCF students appreciate the opportunity to drop in to the CMC and find a study room, a computer, or a spot to do some collaborative work. Although we are a library, learning and computer lab, we have not received updates of equipment and technology in several years. There is no dedicated fund to provide student computers and technology in the CMC or the main library which is why we rely so heavily upon tech fee support. If we are to maintain our status as learning and computer lab in a manner that is effective and efficient for our students we need the following improvements. There are 27 computers in the general computing area of the CMC. These computers are approximately 8 years old and were given, used, to the CMC by the main library. Our eight year old computers consistently have software and hardware issues. Students use these computers to complete assignments, to participate in their online courses and complete online coursework. These issues will not improve as the computers continue to age and the technological environment will deteriorate greatly. There are 2 desktop scanners that need to be replaced. Like our computers, our desktop scanners were used for several years in the main library before given to us. Students consistently complain of the slowness of these scanners but need to use them, nonetheless, to complete assignments, prepare teaching portfolios, and upload documents for their LiveText (COEHP alignment with national, state, and professional standards) requirements. We would like to replace our photocopier with 1 KIC Bookeye 4 Scanner. The CMC checked out nearly 36,000 reserve items to students in the 2013-2014 fiscal year, mostly faculty owned books, textbooks, and educational assessment materials. These items are damaged (loose bindings, missing and ripped pages) on a regular basis in the photocopying process. A faculty member recently requested that we monitor students as they photocopy reserve items. Clearly staffing restrictions do not allow us to fulfill such a request, plus, it is not necessary to monitor our students as the majority do act responsibly. We do believe, however, that the type of equipment used and heavy use of the materials contribute to the damage. The KIC Bookeye 4 Scanner would alleviate the majority of the damage done to materials. Books are placed in a book-angled position and are scanned which eliminates the need to bend books back to copy whole pages. Students may then email the materials to themselves, save to a jump drive, and even create an mp3 of the text free of charge. Our study rooms are checked out on a consistent basis and are favored by both education and non-education majors. But, like our general computing area, the technology has not been updated. Our computers were used and given to us by the main library. Each room is equipped with a table, 4 chairs, a desktop PC/monitor, and a dry erase whiteboard. and important, factor is that the Extron Teamwork 400 stations are installed into the table for equipment protection and efficiency. As well as being a computer lab, the CMC serves as a production and learning lab for our students. Students may come into the production lab and laminate, create die-cuts, and edit video. Our students also learn and practice whiteboard technology in the CMC, a technology that has been embraced by school districts across the United States for several years. Teachers have reported that they wish they had learned how to use this technology in college as they don’t have time once they begin teaching. Luckily, UCF has COEHP faculty who are leaders in this type of technology and incorporate it into teacher preparation on a regular basis. We are the only facility/location that students can go to and complete whiteboard technology assignments and actively “practice” for classroom presentations and lesson planning. Orange County Schools just approved a contract to supply Active Smart Boards to all schools in the district. At the moment we have 1 wall-mounted Active Smart Board which is, unfortunately, powered by an 8 year old computer. The computer is so slow that students often leave the room before the Active Smart Board powers up properly and report to their professors that it won’t work in the CMC. It takes anywhere from 30 minutes to 1 hour for the Active Smart Board to power up because of the aging computer. We would replace the current PC with a new All In One desktop PC that has the capacity to run the software needed to power the Active Smart Board. We also have a Promethean Board, that was gifted to us, from the first generation of white board technology. The board, although mobile, has an 80 in screen and weighs over 200 pounds. If it is used in the CMC in a multi-user capacity (instruction sessions, presentations, etc. ), it takes multiple people to move it and a systems staff member, with 1-2 days notice, to adjust the projector each time it is moved. We can accommodate student requests to move the Promethean Board, but we do have to have advanced notice. Otherwise, our only other option for multi-user presentations, instruction sessions, etc., is a set of 12 Dell mini netbooks. Unfortunately, the netbooks are underpowered and often crash in the middle of presentations. Students often return them minutes after checkout with complaints of slowness, size inappropriateness, multiple shutdowns, etc. Further, the use of the netbooks as an alternative to whiteboard technology does not give UCF students the opportunity to learn or practice the Promethean Board technology which has also been adopted in local schools. If the Promethean Board is updated to a newer, lighter version it will be versatile enough for students, faculty, and staff to move it throughout the CMC (without systems staff having to accommodate this) and actually use it for presentations, instructional sessions, and lesson planning. We would provide the 65” Promethean Board Active Panel Touch and accessories to make it run, including a cart, laptop, and speakers. In the same vein, our schools enhance learning by providing children with more electronic resources than ever before through laptop, tablet, and smartphone capabilities. As a matter of fact many school districts distribute their textbooks to students online. Although expected from a learning lab, the CMC has not had the opportunity to provide students with tablets and relevant apps that would help them with assignments and lesson planning. We would provide 30 iPads, pre-loaded with relevant Pk-12th grade apps, for students to checkout from the CMC. See Attachment C2. The apps were carefully selected from among award-winning apps (American Association of School Librarians Best Apps for Teaching and Learning 2014), those that were highly reviewed, and those recommended by faculty and students. The apps cover a wide range of subjects. We are also requesting the storage equipment for the iPads and an iMac for syncing the iPads. Although the UCF CMC acts as a best practices model for PK-12th grade schools, we have found that we are behind the public schools in other technologies as well. Public and private schools are providing children with 3-D printer technology in their classes to improve critical and creative thinking skills by solving real world problems. Hagerty High School (Seminole County Public Schools) has two, and Hagerty High School teacher, Po Dickinson who also brings her Future Educators of America Honor Society students to the UCF CMC, highly recommends that the CMC acquire such technology as a training tool. The majority of our students have not had an opportunity to learn this technology or practice it. We would provide a Medium 3-D printer, scanner, and PC for Scanner so that our UCF students can become comfortable with the technology and ways to use if effectively in their future classrooms. This would be a great resource addition to the CMC and, as with all of our resources, any UCF student would have access to our 3-D printing capabilities. We would also provide 5 point and shoot digital cameras for checkout to our students. Despite the remarkable camera capabilities of many smartphones, we still have frequent requests for point and shoot digital cameras for classroom observation and assignments but have not been able to provide them to our students. Active Smart Board could potentially each service 30 or more students at a time. For the purposes of the proposal we calculated 5 persons per board for a total of 10 students. The 3-D printer/computer/scanner would service 1 person at a time. And, the 5 digital cameras would service 5 students. Thus, the simultaneous use is 85 (with the potential for more, factoring in the total audience for the white boards). These technology improvements and enhancements are important because the CMC serves as a library, computer lab and learning lab. Students and faculty rely on the CMC to make readily available the technology that students need in order to complete their assignments and coursework and to practice and experiment with PK-12th grade classroom innovation. Right now, we are not fulfilling our students’ needs. The public schools are, in many cases, ahead of us in technology and equipment. Kathy Green, Coordinator of Instructional Resources for the Seminole County Public Schools, reviewed the items that we are requesting in this Proposal. world. Our students care about the CMC and their education at UCF. We have included student testimonials from education majors, engineering majors, etc. who frequent the CMC and wanted to share their desire to see the technology here brought to standard. Circulation and use statistics of all CMC materials will allow us to gauge the use of the resources. Furthermore, the CMC will implement a yearly survey to solicit student feedback concerning the use of the new technology and other CMC services. Also, given the modest size of the CMC, openness of the facility, and the high amount of interface between patrons and CMC staff, staff will be able to easily observe and monitor usage, assist students, answer questions, and make adjustments to usability of equipment if needed, thus helping to enhance project success. The technology that we are requesting should have a life of 5-7 years. The project does not require additional staffing. Library IT staff will maintain technology equipment. 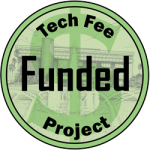 No additional tech fee resources should be needed for sustainability.